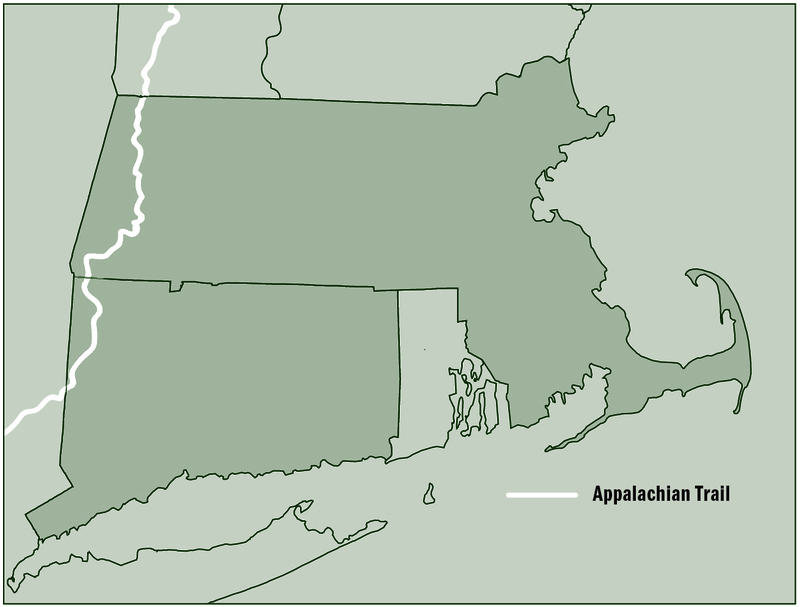 The AT in Connecticut is one of the shortest sections by state. (Only West Virginia at 4 miles and Maryland at 40.9 miles have fewer miles within their borders.) Yet, the 50-ish miles of the Nutmeg State make for quite a pleasurable jaunt. Interestingly, the highest point in the state isn’t a summit. It’s the flank of Mount Frissell (the top of the mountain is in Massachusetts). The tallest mountain located entirely within Connecticut is Bear Mountain (2316′), two miles south of the Massachusetts border. The walk from here to New York is a pleasant mixture of ridge walking, woods walking and a five-mile stretch along the Housatonic River. Bear Mountain as seen from Race Mountain. I believe that the hiking here is the best in the state. The best approach is from Sages Ravine. The easiest place to access the trail near the northern Connecticut border is via Sages Brook Campground. From there, it’s about a one-mile walk to junction with the AT. At the southern end of the trip, you’ll hike into New York state. This is a beautiful section of trail with occasional far-flung views from ridge tops. It’s also a great way to get one state under your belt on a single trip. For specific trail planning information, check out the AT Data Book. If you are interested in hiking the trail, you may find my book Appalachian Odyssey: A 28-year hike on America’s trail a useful resource. I section-hiked the AT over nearly three decades with a good friend and we learned a lot! If you are interested in the history of the Appalachian Trail — how the trail came into existence in the first place and the powerful personalities that got it built —you may enjoy my book, Blazing Ahead: Benton MacKaye, Myron Avery and the Rivalry that Built the Appalachian Trail. If you have any questions about trip planning, please contact me on Twitter (@JeffRyanAuthor) or by email (jeff@jeffryanauthor.com). I look forward to hearing from you.